It’s always nice when something much-anticipated turns out to be better than you hoped. 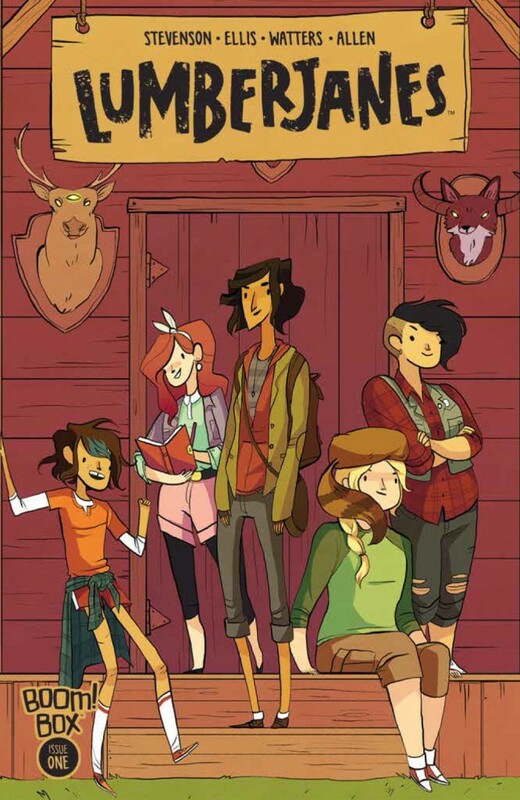 Lumberjanes is a strong start to a girls’ adventure series written by Noelle Stevenson and Grace Ellis and drawn by Brooke Allen. There are evocations of all kinds of “girls in the woods” victim stories, starting with Little Red Riding Hood, but these scouts are no victims or shrinking violets. When they hear scary noises, they spring into action poses, ready to defend themselves and their friends. 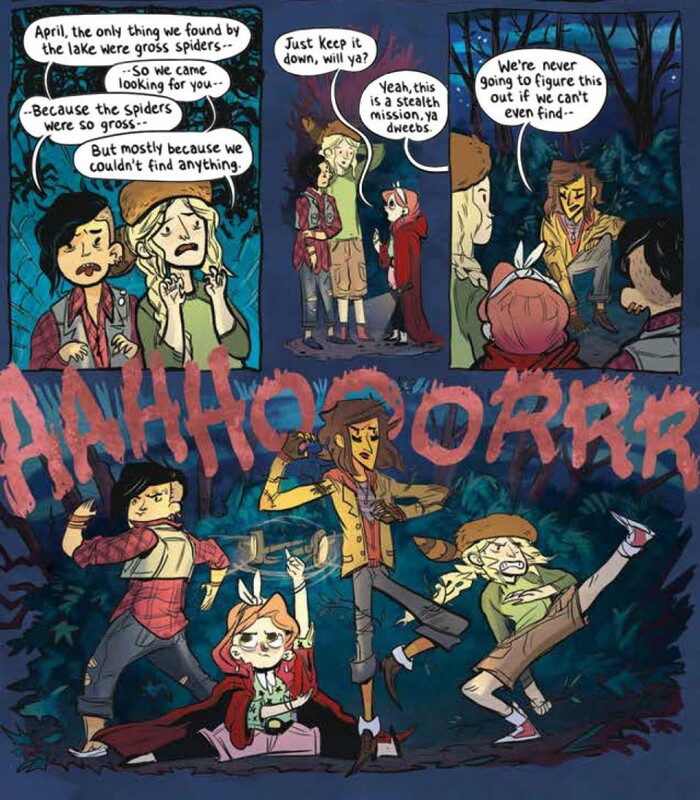 Mal, Molly, April, Ripley, and Jo are all campers, investigating weird goings-on and frustrating their counselor, Jen. The character designs look as though they all came in from different sources, down to different styles of inking, but they oddly work together. (A wonderful metaphor, actually, and an interesting choice in this age of the internet mash-up.) The monsters aren’t the usual woodland creatures; this is a heightened adventure, with three-eyed fanged foxes fought off in the opening sequence. Allen does movement well, with a sense that these characters are active between panels, always in motion. There are a WHOLE lot of readers waiting for this kind of comic. Instead of a team with The Girl, this team is made up of different kinds of girls, so there’s more than one type of woman to read about or admire. They’re all friends, not rivals, so even when they disagree, we know they support each other. They do exciting things on their own, without waiting for anyone to give them a mission or a purpose. There’s a mystery to solve — just what is going on at the camp? — and further adventures to have. It’s terrible that these basic statements count as praise, but only because there’s such a gap in the comic market when it comes to these kinds of stories. We don’t know much about the individual personalities here, yet, but that’s another reason to read future issues, to find out more specifics about how they’re different. This issue focuses on the teamwork. About my only complaint with this comic is that it’s begging for people to wait for the collection. It’s $4 an issue for 22 pages of story, which is standard but still expensive, and since it’s from Boom!, there are multiple alternative covers, many of which are exclusive to a particular event or store, in an attempt to drain more money from customers for the same content. The eventual book will be a better deal and (I’m assuming) have all the images in one place. The only downside to that plan is that this comic is so much fun, I can’t imagine anyone wanting to wait for it.